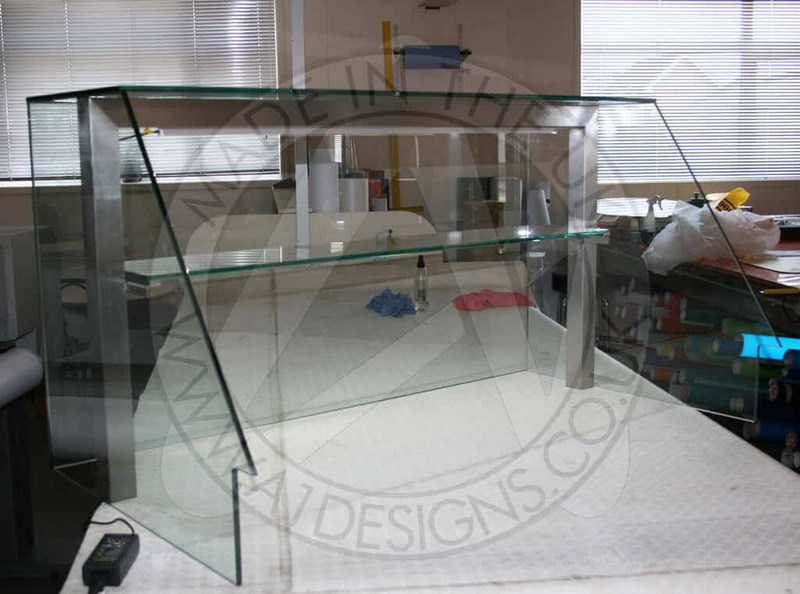 Here at A1deSIGNS, we offer bespoke glass furniture to clients in and around the United Kingdom. We strive for perfection with every single one of the bespoke glass furniture pieces that we offer to our valued clients, which is one of the main reasons why we firmly believe that we should be your first and only port of call for bespoke glass furniture, anywhere in the United Kingdom. UV Bonded Bespoke Glass furniture adds that designer, sleek feel with clean lines and crystal clear bonds, enhancing any environment it is placed in with that special bespoke look. 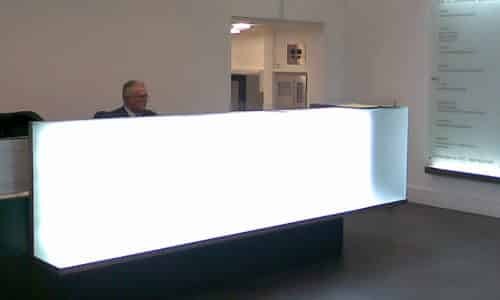 Through the use of UV Cured adhesives, bespoke glass furniture manufactured from glass alone is now possible. With the added ability to adhere glass to metal, wood and marble, creating crystal clear bonds that stand the test of time, there are now endless possibilities for bespoke glass furniture such as cabinets, tables and display cases, helping to enhance the look of any room they are placed in. Bespoke glass furniture is a new service A1deSIGNS is providing. 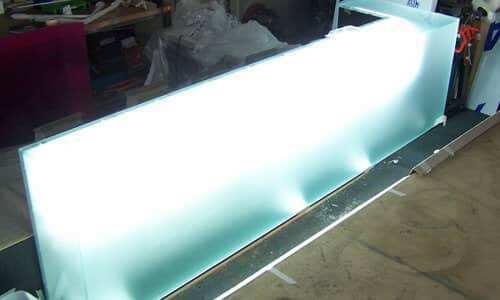 All bespoke glass furniture is made from toughened glass and involves the process of UV Bonding the glass together. The bond when fully cured is stronger than the toughened glass itself. 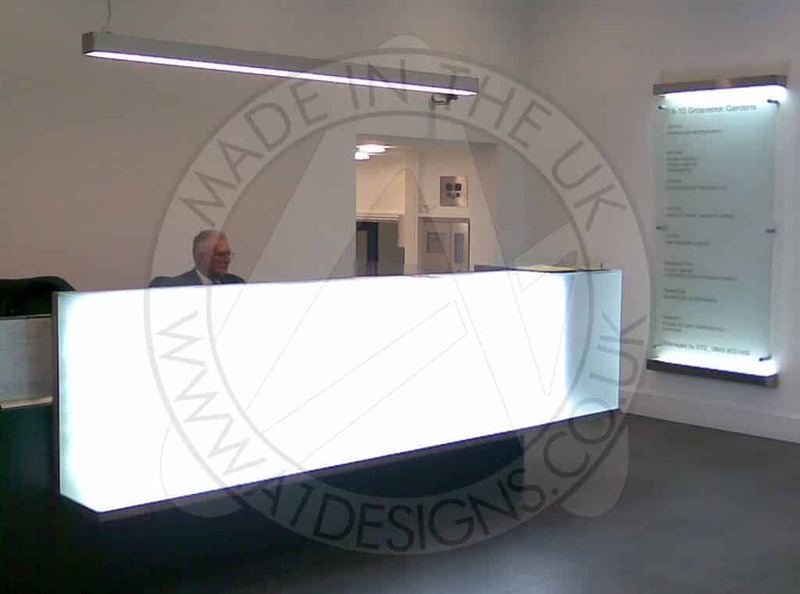 The bespoke glass furniture service has been put into place to complement both our cold cathode lighting service and our signage service. We hope this addition to our services will help us bring glass, signage and lighting together, creating stunning effects. Do not place very hot or very cold items on the glass surface(s) unless adequately thick table mats are used to prevent such items from coming into contact with the glass. Do not sit or stand upon the glass surface(s). Do not use the glass as a chopping surface. Do not strike the glass with hard pointed items. When cleaning glass panels, use a damp cloth or leather with washing up liquid or soft soap if necessary. Do not use washing powders or any other substances containing abrasives since these substances scratch glass. Can I bond glass that is not ground and polished? This will not work well, as differences in the layer thickness of the adhesive will lead to tensions in the bonding area, which will result in cohesion cracks in the adhesive and finally the destruction of the bond. Can I bond to the backside of the mirror? Due to safety reasons, we advise not to produce such bonds, as the bonding will be only as good as the adhesion of the mirror backing. Can I bond on top of a mirror? Yes, the reflection of the mirror backing will cure the adhesive. Can I bond sandblasted glass? Yes, however the pre-curing time has to be observed exactly, as cleaning hardened glue on sandblasted glass will be extremely difficult. Prepare test bonding before you start the final job! Can I bond coloured glass? Yes, however longer curing times have to be considered due to the tinting of the glass. Can I bond tempered glass? Yes, however the object to be bonded should be a “closed construction”. Can I bond plastic and glass? Yes, however, only certain thermoplastic materials can be bonded, so be sure to make tests before bonding the final object. Can I bond wood and glass? Can I bond metal and glass?